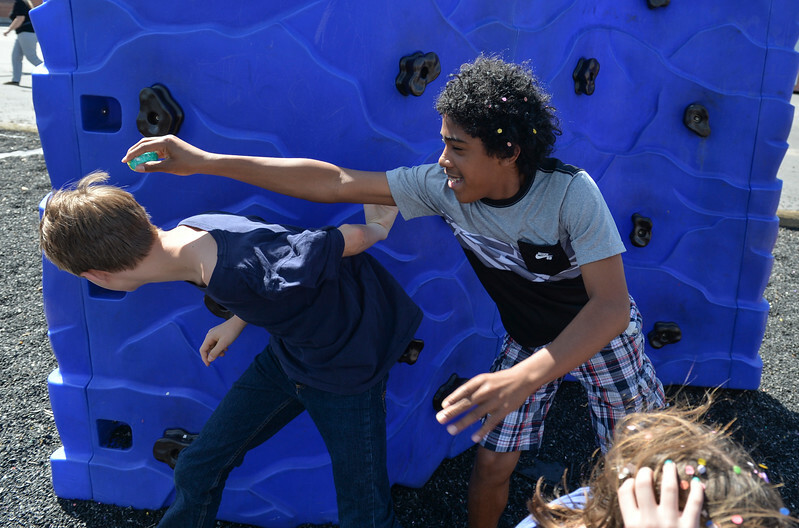 Junior high students rush to hunt for Mexican Cascarones Easter Eggs Thursday at Holy Name Catholic School. Students from spanish language studies made the cascarones by emptying eggs then filling them with confetti. The confetti-filled eggs are part of hispanic tradition that involves cracking the eggs over a person’s head. The showering of the confetti is said to bring good luck and good fortune to the recipient. In a religious context, the eggs represent the empty tomb and the resurrection of Jesus. 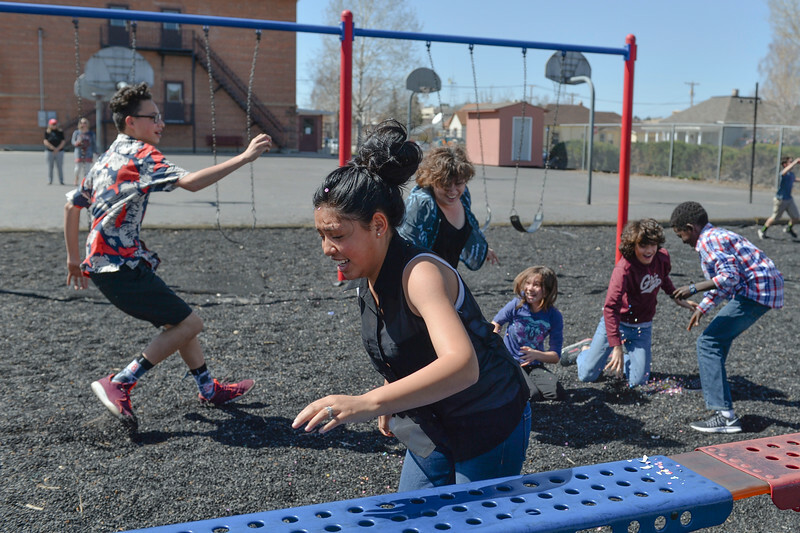 Silvia Garza runs away during a hunt for Mexican Cascarones Easter Eggs Thursday at Holy Name Catholic School. Students from spanish language studies made the cascarones by emptying eggs then filling them with confetti. The confetti-filled eggs are part of hispanic tradition that involves cracking the eggs over a person’s head. The showering of the confetti is said to bring good luck and good fortune to the recipient. In a religious context, the eggs represent the empty tomb and the resurrection of Jesus. 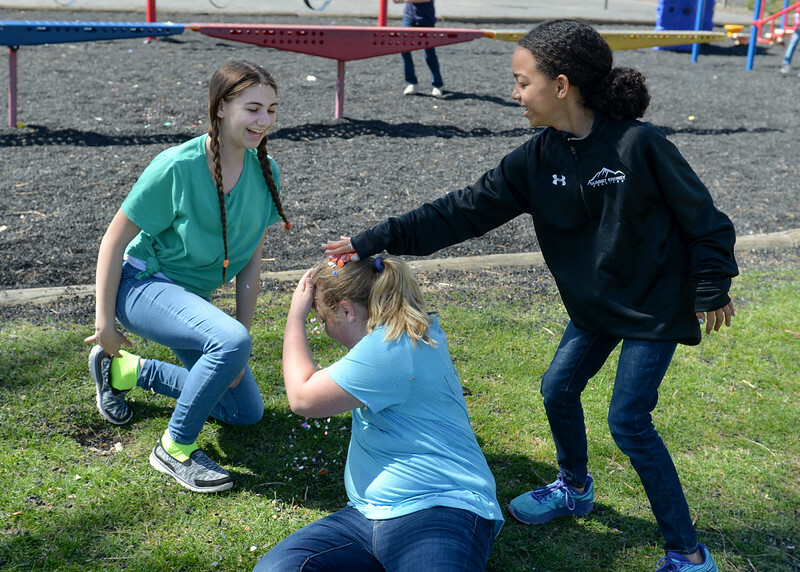 Gigi Miller, reacts as Layne Sweeney cracks an egg over Julia Smart’s head during a hunt for Mexican Cascarones Easter Eggs Thursday at Holy Name Catholic School. Students from spanish language studies made the cascarones by emptying eggs then filling them with confetti. The confetti-filled eggs are part of hispanic tradition that involves cracking the eggs over a person’s head. The showering of the confetti is said to bring good luck and good fortune to the recipient. In a religious context, the eggs represent the empty tomb and the resurrection of Jesus. 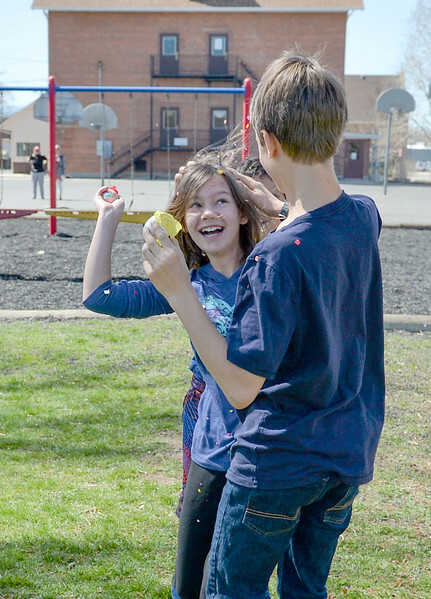 Junior high students Zia Brown and Nathan Ulery dispense shell hits during a hunt for Mexican Cascarones Easter Eggs Thursday at Holy Name Catholic School. 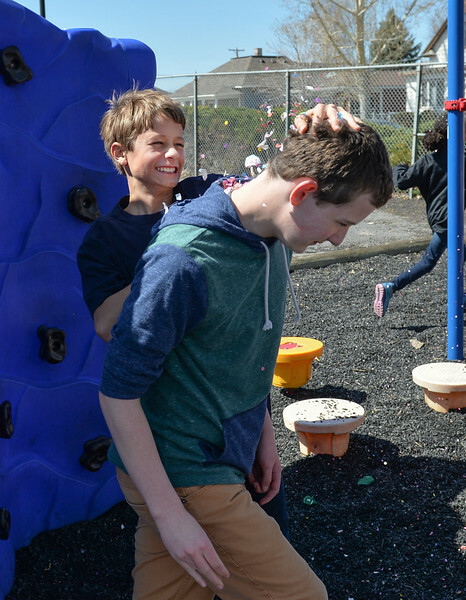 Students from spanish language studies made the cascarones by emptying eggs then filling them with confetti. The confetti-filled eggs are part of hispanic tradition that involves cracking the eggs over a person’s head. The showering of the confetti is said to bring good luck and good fortune to the recipient. In a religious context, the eggs represent the empty tomb and the resurrection of Jesus. 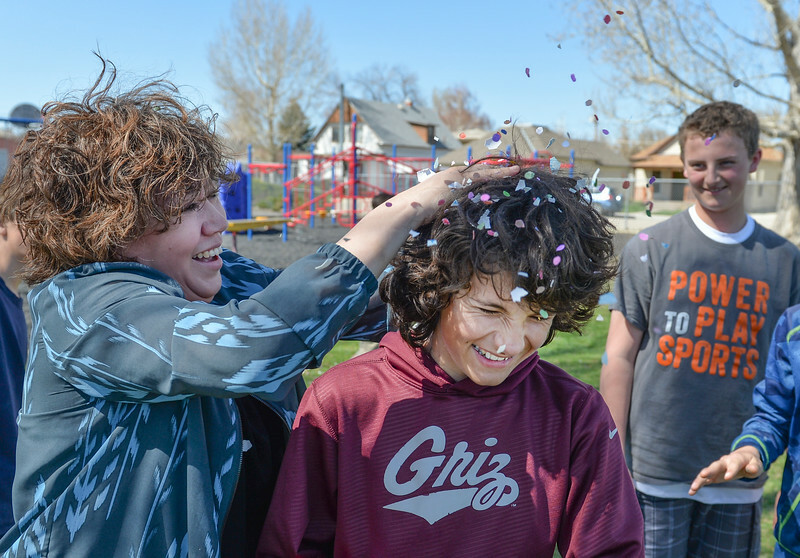 Junior high students Nathan Ulery hits Henri Schaefer with confetti during a hunt for Mexican Cascarones Easter Eggs Thursday at Holy Name Catholic School. Students from spanish language studies made the cascarones by emptying eggs then filling them with confetti. The confetti-filled eggs are part of hispanic tradition that involves cracking the eggs over a person’s head. The showering of the confetti is said to bring good luck and good fortune to the recipient. In a religious context, the eggs represent the empty tomb and the resurrection of Jesus. 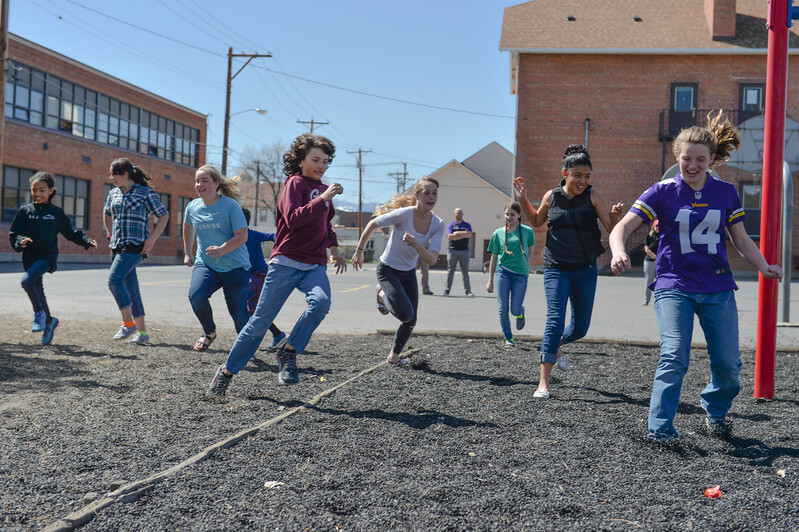 Junior high students Nathan Ulery runs away as Zach Luedtke attempts a shell hit during a hunt for Mexican Cascarones Easter Eggs Thursday at Holy Name Catholic School. Students from spanish language studies made the cascarones by emptying eggs then filling them with confetti. The confetti-filled eggs are part of hispanic tradition that involves cracking the eggs over a person’s head. The showering of the confetti is said to bring good luck and good fortune to the recipient. In a religious context, the eggs represent the empty tomb and the resurrection of Jesus. 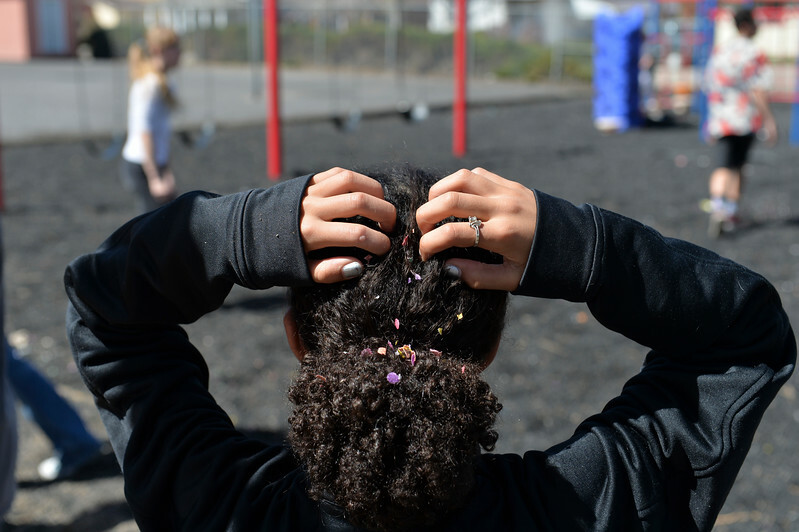 Layne Sweeney brushes confetti out of her hair during a hunt for Mexican Cascarones Easter Eggs Thursday at Holy Name Catholic School. Students from spanish language studies made the cascarones by emptying eggs then filling them with confetti. The confetti-filled eggs are part of hispanic tradition that involves cracking the eggs over a person’s head. The showering of the confetti is said to bring good luck and good fortune to the recipient. In a religious context, the eggs represent the empty tomb and the resurrection of Jesus.